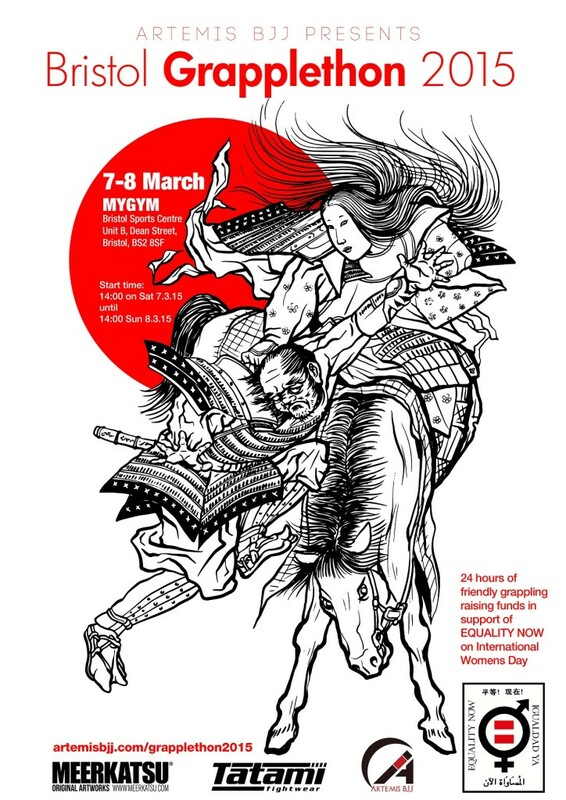 The GrappleThon for this year is one I've been wanting to do for a long time, as in 2015 we're supporting Equality Now. I've had a direct debit with that charity for around a decade now. As International Women's Day falls on a weekend in 2015, I thought this would be the perfect opportunity to finally do a GrappleThon for them. Full details of the event here, and if you'd like to help me reach my £500 target, you can donate here. Whatever grip you choose, you then need to trap their leg on that same side. Otherwise, they will be able to use their leg for base as you attempt to roll them. In order to prevent that, step your same side foot over their lower leg, hooking it in tightly to your bum. This means they are now like a chair with two of its legs missing. If you feel your control is too loose, slide your foot further across towards the other side of your bum, which should eat up some more space. Even if they can't post with their leg, they might be able to use their knee, so you want to have their leg as tightly locked to your body as possible. Also, be careful that you don't end up hooking both their feet, or leave your other leg in range of their hook. It is possible for the person on top to defend the escape by securing a hook with their free leg by your non-trapping leg. Therefore, try to keep the leg they might be able to control out of range. If you find you need more leverage, most commonly if they are posting with their free hand to stop your roll, you could attempt to dislodge that by pushing their arm off the ground. Alternatively, the legendary Rickson Gracie has a great detail, which he demonstrated in a video a while ago. Simply angle your head away from the shoulder you're rolling over: this increases your range of motion. When you've successfully rolled them over, that puts you in the guard position. Remember to posture up when you reach that position: if you are leaning forwards, they can pull you down right into a submission. Teaching Notes: I may reconsider about teaching this with the knee bump to knock them forward and grab their arm. The problem is it can lead to people leaning back and avoiding any grips with their arms on top. That only really makes sense in the very specific situation of not wanting somebody to grab your arm for this particular escape. It is far more likely that you will grab them on a collar to attack, or at least wrap your arm under the head. So I think next time, I'll revert to you having a grip. However, I need to set up the context for that, so it's a grip that the person on top wants to have to help their attack. If people have a gi on, then they want to go for a choke. If they don't (often the case in the women's class: it's only Zoe, Tracey, Ruth and Jenni that have a gi at the moment), then they will still probably want to grab under the head for a more controlling mount. I like to grab under the head for more control, though it does mean I have to teach the second variation of the upa, where you 'comb your hair' to trap that arm against your head, then roll. Still, there's normally plenty of time, so that could be a good solution. Start with the normal version and say about grips, then move on to under the head. That also means I can bring in some details about mount control on top, handily.